When Doing Circles: Do I Really Turn? A fan on our Facebook, Ricky, is stumped by a pattern he’s run into. It’s a slipper pattern. Ricky’s question is really important as it addresses three issues crocheters, who may be unaware may have. See the difference of when turning your work instead of continuously going round. It causes your work to appear like regular crochet as if you were to go back and forth on an afghan project. I whipped up the above diagram for Ricky’s question to give a visual look to why you may want to turn your circle or round projects. In this project above, I am working in the round. Notice the blue area… It looks completely different with a different elevation. It appears sunken in, which it is. From the centre to the start of the blue, I completed this circle going in the same continuous revolution. After each slip stitch, I chain up and crochet in the same direction. 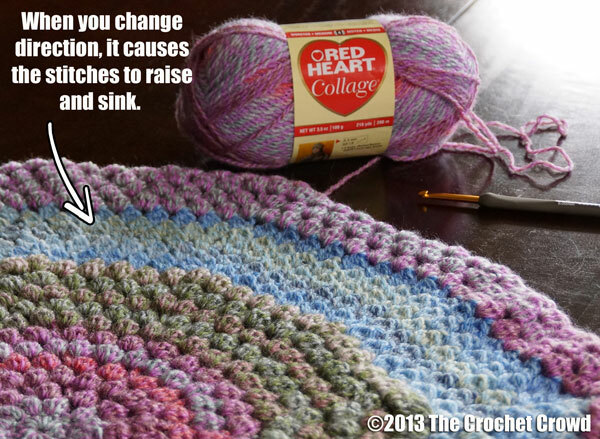 By turning your project, instead of going in a continuous revolution, it changes the sides of crochet. Most of us know about Right Side and Wrong Side in crochet. The picture above is illustrating that the way you see it, you are actually looking at the middle section to be the wrong side up and the blue is in fact the right side facing up. If you are looking for your hats or projects that work in a round to have more of a visual difference or textured layered looks, you would definitely want to turn your project after completing a round. The other main advantage of turning is that your project, when working in a continuous revolution tends to make your project curl up awards on the right side. By turning your project, this causes the stitches to turn downwards because you have changed direction. This settles down the natural tendency of curling upwards. For me, that’s exactly why I did that in the project above. Free Pattern and Video Tutorial by Mikey to complete the wave afghan. Due to the fact I have gone back and forth on this wave afghan. Every other row is the Right Side and vice versa with the wrong side. By turning your work in a circle project, it’s creating the same look. How do you turn in a continuous round? When you get to the end of your revolution. Normally we will just slip stitch to create a join. The next row we normally chain up. Let’s assume 3 Chains for a Double Crochet. We then carry on and continue to Double Crochet in the same direction. When turning, you will finish the revolution. Join with a Slip Stitch. Chain 3 but turn your work so you are crocheting in the direction from which you came. When you get to the end of the revolution, you will join with a slip stitch as normal, Chain 3 and begin double crocheting from the direction from which you came. An easy way to remember is to envision you a crocheting a steering wheel. A steering wheel doesn’t turn continuously. It has a stopping point in both directions when you cannot turn the wheel any further. Like a steering wheel, say you are steering right until you cannot turn the wheel any further. You have no choice but then to turn the wheel left. Apply that thought to your project. Put this in relationship to crochet and doing turns with your crochet circles. Pretend your project is a steering wheel and go back and forth instead of always in the same direction. Why would slippers ask for this? The designer is obviously wanting the slipper to have a textured regular crochet look instead of being flat as if you were going to do a continuous round. This would be completely aesthetics for look. This concept won’t make the slipper any stronger. For more advice, review Advice & Tips here on my blog. You may also visit my website where I have a lot of resources and advice available to you. This entry was posted in Advice & Tips and tagged Advice, Answer, Craft, Crochet, Double Crochet, Facebook, Free Pattern, Knitting and Crochet, Mikey, Pattern, Question, Right Side, Video Tutorial. Bookmark the permalink. 13 Responses to When Doing Circles: Do I Really Turn? Mikey, is it possible to get a link to the pattern of the round thingie shown in the above diagram? It looks very tempting! Hi Mikey, I hope you can help me! I am crocheting some Amigurumi toys for my nephews. I haven’t made toys before and these require me to crochet the round, slip stitch, then without adding any chains at the beginning just keep on crocheting in the same direction as I have been. The result, at least for me, is a very noticeable join line running down the toy from each time I finish/begin a row. I am sure I saw somewhere how this can be avoided but can’t find it now. Please assist! I would avoid the slip stitch completely if you are doing circles and crochet in a continuous circle. Use a stitch marker to tell when you have rotated around your circle to count. This will result is a nicer look. With crochet, you will always see the seam. The only way to avoid that is to not slip stitch and that’s what I would do. Thank you so much for your incredibly quick reply, I will get on with the next toy and put your advice to use! You’re welcome… If anything you remember from me… Beat to your own crochet drum. Change the rules when you think you need to. That’s how discoveries are made by throwing the manual away and discovering different ways to overcome something that may be bothering you with crochet. 🙂 Good Luck. I had an “aha” moment reading this blog and thought granny squares! I am going to try turning after each row to prevent the slanted look I always get. I googled this and was amazed at the number of patterns and sites where turning after every row in a granny is the norm rather than going round and round. I had never heard of it, or thought of it before. Again, thank you Mikey for the inspiration and great ideas!!! That’s an interesting point. Your AHA moment is also mine. That solution never occurred to me as a solution for stopping the slant! Great observation and thanks so much for sharing. When crocheting granny afghans if you change direction every round it stops it from curling and is not noticeable in the pattern – both sides are equally the ‘wrong’ or ‘right’ side. Also, if you’re changing colours by changing direction you stop the middle squares from getting the skewed look. OH, TY, and TY again. I didn’t like that skewed look at all. Now I’m going to go make one. TY again. Now I know why the granny afghan is curling in the middle, I feel I need to block it so it lay’s flat. I figured that it was my tension getting tighter off & on. Thanks for the info!! Thank you so much for this information. It really makes sense, I always thought I am just immagining it to be different, now I know. I really found it useful and will definitely use it. What a great simple explanation! Thank you!